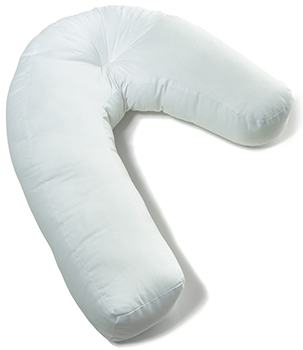 This side sleeping pillow improves your posture and reduces pain with magnet therapy! This magnetic pillow will improve your sleep as well as helping you to feel comfortable and ache-free on waking. It does this through the use of its special shape and with the power of magnet therapy – so you are getting two fantastically effective solutions to your back pain in one! The SideSleeper pillow has magnets deposited along its length, underneath the padding so that you can’t feel them. The magnets are there to increase the circulation along your spine and shoulders while you sleep to help relieve aches and pains, leaving you refreshed and energised the next morning. The Side Sleeper has been thoroughly designed to make your sleep as perfect as possible. The way that it positions your neck to open your airways doesn’t just make breathing easy, it will prevent you from snoring for a beater night’s sleep for both you and anyone next to you! The ear well reduces pressure on your ear canal, preventing any annoying clicking, popping or fullness that you might normally experience. The hollow fibre filling of the Side Sleeper is hypoallergenic so it’s perfect for people with sensitive skin or sinuses. It’s machine washable so you can easily keep it clear of dust and other aggravating particles. The material allows air to circulate, wicking away any moisture or sweat that starts to build up in the night and keeping you at the perfect temperature. This is an absolute godsend if you’re regularly kept awake by overheating or night sweats! What are you waiting for? Say goodbye to restless nights and swap your saggy old pillow for a SideSleeper with magnets for pain-free, gloriously deep sleep that you can rely on.